Maternity clothes? I'm mostly wearing maternity. I'm still wearing non-maternity tops and I can get away with leggings and dresses but maternity clothes are so much more comfortable! I love my Loft maternity clothes that I purchased. Sleep: I've been sleeping pretty good. I usually wake up once early in the morning, between three and 5 but can usually fall back asleep until my alarm goes off. I know the added stress of student teaching is probably helping me sleep. Best moment this week: shopping for baby girl clothes!!! I've picked up a few outfits but I haven't gone overboard. I have found some really cute things at Target but a lot of stores haven't put out their spring stuff yet. I want to decorate a girl nursery so bad but Peyton is still in his crib and I don't know when I'll be able to turn his room into a girl room yet! Also...I realized that I haven't shared her name on the blog until now! Charlee Jo will be joining our family in May and we can't wait! Worst moment this week: I was horribly sick with a cold a few weeks ago and didn't get out of bed for 27 hours. It was horrible and I'm still not completely over it. I still feel congested especially when I wake up in the mornings. Being sick and pregnant are no fun! Miss anything? Coffee. It's an ongoing thing. I should actually answer this with just caffeine. 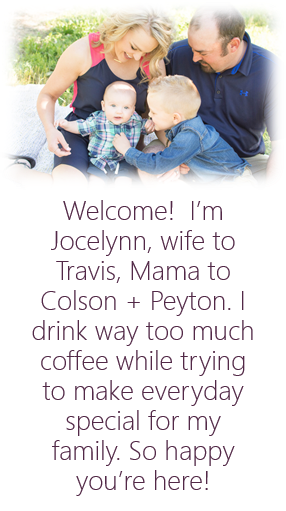 In my previous pregnancies, caffeine hasn't affected me. This go around, my body doesn't like it. I've been drinking more tea with caffeine recently and unless I drink it on a full belly, I'm sick. So, I'm looking forward to drinking caffeine again! Cravings: I think most of my cravings have went away. I haven't eaten blueberries or cucumbers in weeks and don't miss them at all. My first choice for lunch is always a salad. I had fast food a few times in the last week and didn't enjoy it at all. I'm thankful for that! I like real food I guess. Symptoms: After pushing around a shopping cart with two kids and all the things we found at Target, my stomach hurt so bad I was almost in tears. I was just wearing normal jeans and a sweater so I didn't have any support for my belly. After sitting in my car for a good ten minutes I was totally fine. I definitely need the support. I also have been waking up with leg cramps. I know I need to be drinking a lot more water! I always seems to get them, but don't remember getting them until my third trimester with the boys. And, holy emotional!!! I will cry over just about anything! I was sitting in a parent teacher conference and was telling the parent how much I enjoyed their child and started crying! Travis said something to me the other night and I literally had to fight back the tears and just stopped talking to him. Colson will say something sweet and my eyes just fill with tears! Looking forward to: Like I said above, I'm really looking forward to turning the nursery into a baby girl room. I have so many visions for what I'd love the space to be. I'm just not sure when that's going to happen. It's hard to take Peyton out of the crib just yet. He's never tried escaping and he dislikes going to bed. At least when he's in the crib we know he isn't going to walk out of his room!